International journalists from over 13 nationalities illustrate their perception on Danish society through photo stories, which are exposed in Aarhus City Hall. Fishing, national sweets, favorite sports, religion, patriotism and immigration are some of the aspects of Denmark portrayed in the photo exhibition “Mundus Lenses: Aarhus through the Perspective of International Journalists”. The images represent the work of 20 master’s students from over 13 nationalities, who participate in the Erasmus Mundus Program on Journalism, Media and Globalization, in Aarhus University. The photo journalist Imal Hashimi worked closely with the students, helping them to improve their photo skills and develop their projects. “I wanted the students to come closer to the Danish society and try to represent its different aspects through pictures”, he says. On the other hand, “the exhibition is also an opportunity to show the Danes that these international journalists are interested in their lives and culture”, he adds. Among the photo stories exposed, Hashimi highlights the work of Daniela De Lorenzo, an Italian student who portrayed the live of a Danish male called Jens, one of the most common names in Denmark. Through her images, she tells the story of a young adult who likes to watch soccer matches, to cook and spend time with friends, and who also has to deal with multiple sclerosis, an illness that affects the brain and the spinal cord and may influence the ability to write, speak or walk. “I had the opportunity to get in touch with a Dane and see how he spends his time. I followed him all over. My intention was to represent all the aspects of his life: his family, friends, studies, hobbies and his illness as well”, she says. Jens Hansen, who she portrayed in her pictures, was present at the City Hall during the opening of the exhibition, on May 15th. “It´s partly embarrassing and partly honoring”, he comments about having his images on the wall. Besides Daniela’s work, another photo story which makes a large part of the exhibition is the work of the Brazilian journalist Pericles Carvalho, who intended to illustrate the relation between Danish people and the Baltic Sea. “When I was younger I studied the Vikings and how they built an empire through naval superiority. Being in Denmark I wanted to check the remaining connection between the current sailors and the Viking era”, he says. Despite initial difficulties, such as communicating in English and finding fisherman, Pericles managed to finally follow and photograph some. He was able to illustrate his main conclusion on the historical connection of Danes with the ocean. “There is a feeling of nostalgia about the past. Nowadays, Danish people only fish for sport, not professionally, because of a law. In addition, the harbor is full of containers due to commercial activities, so it is not favorable for fishing anymore”, he points out. 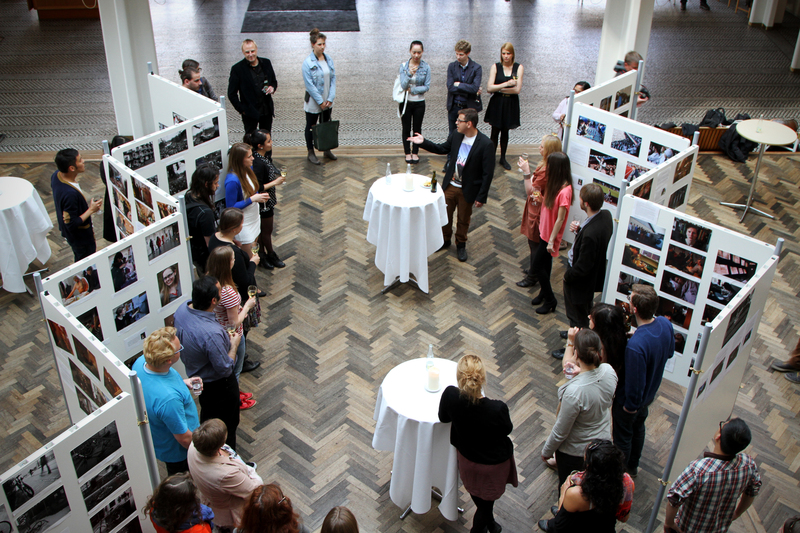 Not only Pericles’ photos, but overall the exhibition impressed the director of the Journalism School, Henrik Bødker. “It’s just what I hoped it would be. The students managed to illustrate places and aspects of the Danish culture in a different way”, he comments. The director adds that all the stories have something unique and show original ideas, from the loneliness of abandoned bikes to the coziness of bars and restaurants. “They all represent what it is like to be a Dane”, he says. The pictures will be exposed in the City Hall until May 24th. Is there an online site where I can see everyone’s photo essays?